Can I file my return without registering with the site? For filing your return you need to register with us. How long does it take to file my return? Spend just a few minutes and share information with us to file your return. Can I save my tax return and come back after a while to file my return? Yes, you can come back and file your return. What is the maximum number of vehicles per return? We support as much as it has been allowed by IRS. IRS recommends that for businesses that own more than 25 vehicles to file electronically. Can I keep multiple businesses with single user registration? Of course, you can have multiple businesses with single registration. How do I get my forgotten User ID / Password? Click on the ‘Forgot User ID / Password’ link. We will send the details to your email ID. Do I need to print before filing electronically? You can print if you choose Paper filing of your Tax. Also, you can print for your recordkeeping before or after you e-file. The latest 3 years of Tax returns need to be maintained. What if I need my old return which is not available online with your system? We maintain your returns from the date you start filing your tax through us. What if I need to change my Business information? Use Login and Password to open your account. Update your latest Business Information. Ensure that the Business Information entered here matches with Federal documents. Can I do upload multiple vehicles information at once? Yes, using our template you can add multiple vehicle information and upload. What should I do if do not have an EIN? Generally, a business needs an EIN (Employer Identification Number). If you do not have an EIN, you can apply for one. Now you can apply online to get your EIN. This service is absolutely free of charge. How to print my payment receipt? After you enter your business details, information on all reportable vehicles and the details for claiming a credit for the overpayment made or claiming credit for the tax paid on a vehicle that was sold/ destroyed/ Stolen/Transferred, you get the amount which is due to or from the IRS. Enter your credit card details to complete the payment charged by Tax 2290 for the tax preparation service. A payment receipt is generated. Click the printer icon to print the receipt. You can also use the printer icon in the History section of the My Home page to print the receipt. Form 2290 is used to file tax for Heavy Highway Vehicles. What is meant by E-File? E-Filing is transmitting Business Tax Returns to the IRS through the internet. Electronic filing is the safest, most secure and private way to send your tax return to the IRS.Once you E-file your return you receive an electronic acknowledgement that the IRS has accepted your return for processing. Once the IRS accepts your return, your schedule 1 will be stamped and sent to you.It will have the list of vehicles for which you have filed the return. The stamped copy of Schedule 1 can be used as a proof of payment when registering vehicle(s) with the IRS.If there is any error in the data provided by you then your return may be rejected in which case you will not receive your Schedule 1. What is meant by an Electronic Return Originator (ERO)? ERO is an authorized IRS e-file Provider that originates the electronic submission of a tax return to the IRS. EROs may include Certified Public Accountants (CPAs), tax attorneys, IRS-enrolled agents, and tax preparation businesses. Only EROs can prepare tax returns and then transmit them electronically. Who must file the Tax? All individuals, Limited Liability Companies (LLC), Corporations, Partnerships, or any other organization such as a non-profit, charitable, educational, etc., must file the tax. Who is liable to pay the tax if the vehicle is of Dual Registration? The Owner is liable to pay the tax if a taxable vehicle is registered in the name of 2 persons. This rule also applies to dual registration of a leased vehicle. What should be done if the previous owner does not pay the tax and the current owner of the vehicle is different, before the end of the tax period? The current owner is also liable for the total tax for the entire tax period to the extent not paid by the previous owner. The current owner has to file Form 2290 and pay the tax by the last day of the month following the month the notification is received from IRS that the tax has not been paid by the previous owner. What is meant by Logging Vehicles? Logging vehicles are registered highway motor vehicles that are used exclusively in the transportation of harvested forest products. What types of vehicles are taxable? Highway motor vehicles that have a Taxable Gross weight of 55000 pounds or more are taxable. What is a Highway Motor Vehicle? Highway Motor Vehicles are self-propelled vehicles designed to carry loads over public highways, whether or not also designed to perform other functions. A Public Highway is any road in the United States that is not a Private Roadway. This includes federal, state, county and city roads. Which vehicles are not considered Highway motor vehicles? Vehicles such as, specially designed mobile machinery for non-transportation functions, Vehicles specially designed for off-highway transportation and Non-transportation trailers and semi-trailers are not considered as highway motor vehicles. Form 2290 must be filed for each month a taxable vehicle is first used on public highways during the current period. The current period begins on July 1, 2011, and ends on June 30, 2012. Form 2290 must be filed by the last day of the month following the month of first use. The filing rules apply whether you are paying the tax or reporting suspension of the tax. Is there any extension of time to file? Before the due date of the return, you may request an extension of time to file your return by writing to the Internal Revenue Service Center, Cincinnati, OH 45999-0031. The letter must fully explain the cause of the delay. Except for taxpayers abroad, the extension may be for no more than 6 months. An extension of time to file does not extend the time to pay the tax. If you want an extension of time to pay, you must request that separately. How to file the Tax? There are two ways in which you can file your return:E- File: E- Filing is transmitting Business Tax Returns to the IRS through the Internet.Paper File: Paper Filing is sending the Business Tax Returns to the IRS through the mail. 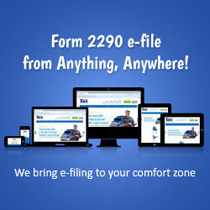 When Form 2290 is paper filed, a copy of the PDF Form 2290 is sent to the IRS address. Where can I file the Tax? Which delivery services need to be used? To meet timely mail filing, you can use DHL Express, Federal Express or United Parcel Service. Can I still file after the due date? The law provides penalties for failing to file returns or pay tax when due. There are also penalties for filing false or fraudulent returns. These penalties are in addition to the interest charge on late payments. The penalty for filing a return late or paying the tax late will not be imposed if you can show reasonable cause for not filing (or paying) on time. If you file after the due date (including extensions), attach an explanation to the return to show reasonable cause. Will there be penalties for failing to file returns? The law provides penalties for failing to file returns or pay tax when due. There are also penalties for filing false or fraudulent returns. The penalty for filing a return late or paying the tax late will not be imposed if you can show reasonable cause for not filing (or paying) on time. If you file after the due date (including extensions), attach an explanation to the return to show reasonable cause. Is there Interest for late payments? Penalties are applicable in addition to the interest charge on late payments. What is meant by Business Name? Business Name is the name given by the Business Owner for their business. An Employer Identification Number (EIN) is also known as a Federal Tax Identification Number, and is used to identify a business entity. Generally, businesses need an EIN. Employer Identification Number is a 9 digit number assigned by IRS to filers of Form 2290. The Vehicle Identification Number (VIN) is a distinctive number assigned to a vehicle to identify it for changing title, vehicle registration and other functions. It contains 17 digits of alphanumeric characters. What is Taxable Gross Weight? Taxable gross weight of a vehicle is actual unloaded weight of vehicle fully equipped for service. It is the weight of maximum load carried on a vehicle. What is meant by Actual unloaded Vehicle? Actual unloaded weight vehicle is an empty weight vehicle. What is meant by Fully Equipped Vehicle? Fully Equipped Vehicles are vehicles which include the body, all accessories, and all equipment attached to or carried on the vehicle for use in its operation or maintenance and a full supply of fuel, oil and water. What should I do if I need to change Address? You can use Form 8822 to notify the IRS in case there is a change in your mailing address. You need to notify the IRS to ensure you receive any IRS correspondence. Also check the Address change box on Form 2290. How do I make a Final return? You can make a Final return if you no longer have vehicles to report on. Also write to the IRS so that the IRS will stop mailing the package 2290 to you. What is Partial period tax table? Partial Period Tax Table helps to find the tax amount if the vehicle was first used on public highways after July of the tax period. What is meant by Amount of Tax? It is the tax amount that needs to be paid to the IRS. What is meant by a Claim? A credit for tax paid for the vehicles that were destroyed, stolen, or sold before June 1, can be claimed on the next Form 2290 filed or a refund of tax paid can be claimed on Form 8849. Which vehicles are considered to be Sold out/ Destroyed vehicles? A vehicle is destroyed when it is damaged by accident or other casualty to such an extent that it is not economical to rebuild. A credit for tax paid can be claimed on the next Form 2290 filed for a vehicle that was destroyed, stolen, or sold before June 1, or a refund of tax paid can be claimed on Form 8849. When is a vehicle considered to be a Suspended Vehicle? A suspended vehicle is a registered highway motor vehicle which has been used for 5000 miles or less on public highways within the 12 month filing period. Once a suspended vehicle exceeds the mileage use limit, the tax becomes due. What is Mileage use limit? Mileage Use Limit is the total mileage for which a vehicle is used during a period regardless of the number of owners. What is meant by an Agricultural Vehicle? An Agricultural Vehicle is a registered highway motor vehicle that is primarily used for farming purposes which includes transporting any farm commodity to or from a farm or used directly for agricultural production. 1. Electronic funds withdrawal (direct debit) only if filing electronically. 3. Credit or debit card payment. 4. Check or money order. What is meant by EFTPS? Electronic Federal Tax Payment System - Electronic payment method is convenient, safe and secure for paying taxes or user fees. Taxpayers can authorize an electronic fund withdrawal, use a credit card or enroll in the U.S Treasury’s Electronic Federal Tax Payment System (EFTPS). What is Electronic Funds withdrawal? Filing Form 2290 electronically, you can authorize a direct debit to make payment. What is a Payment voucher? A Payment voucher will help the IRS to process your payment more accurately and efficiently. If you have your Form 2290 prepared by a third party, provide this payment voucher to the return preparer. Schedule 1 is an attachment which has to be submitted along with Form 2290. The Schedule will be stamped and returned to you as a proof of payment when registering vehicle(s) with a state. Your Return may be rejected if Schedule 1 is not attached. What is the proof of payment for state registration? Use the stamped copy of Schedule 1 as proof of payment. If you do not have the stamped copy, you may use a photocopy of Form 2290, Schedule 1, and both sides of your canceled check as proof of payment. Who can be a Third Party Designee for me? A Third Party Designee can be any other person who has been given the authority to discuss your tax payment details with the IRS. How long do I need to maintain Records? You need to keep records for all taxable highway vehicles registered in your name for at least 3 years after the date the tax is due or paid, whichever is later. They must be available at all times for inspection by the IRS. Also keep copies of all returns and schedules you have filed. Keep your records even if a vehicle is registered in your name for only a portion of a period. Whom should I contact if I need Tax help? Contact your Tax Payer advocate through a toll-free number 1-877-777-4778 or TTY/TDD 1-800-829-4059 for any tax help. What are the Exemptions from Tax? To be exempt from the tax, a highway motor vehicle must be used and actually operated by: - The Federal Government, - The District of Columbia, - A state or local government, - The American National Red Cross, - Non-profit volunteer fire department, ambulance association, or rescue squad, - An Indian tribal government but only if the vehicle's use involves the exercise of an essential tribal government function, or - A mass transportation authority if it is created under a statute that gives it certain powers normally exercised by the state. Also exempt from the tax (not required to file Form 2290) are: - Qualified blood collector vehicles used by qualified blood collector organizations, and - Mobile machinery that meets the specifications for a chassis as described under specially designed mobile machinery for non-transportation functions later. What is meant by Special permits? o At more than the weight at which it is registered in the state. However, special temporary travel permits do not include permits that are issued for your vehicle if the total amount of time covered by those permits is more than 60 days or more than 2 months during a taxable year." What is meant by my consent to disclosure? Consent to Disclosure is giving permission to the Internal Revenue Service (IRS) to disclose information about your payment of the Heavy Highway Vehicle Use Tax (HVUT) for the tax period to the federal Department of Transportation (DOT), U.S. Customs and Border Protection (CBP), and to state Departments of Motor Vehicles (DMV). The information disclosed to the DOT, CBP, and state DMVs will be your Vehicle Identification Number (VIN) and verification that you have paid the HVUT. The IRS may disclose the information to the DOT, CBP, and to the DMVs of the 50 states and the District of Columbia who have other taxing, registration, or information collecting authority. I used your software to file my returns last year. Can I import the vehicle information from my last year returns? Yes. You can import the taxable vehicle information from the previous year tax returns. You can import the vehicle information in two ways: -	Import only selective vehicles. -	Download all your previous year vehicle information into an excel format. You can make any modifications if needed, and the same can be uploaded using bulk upload facility. If the claim I make in Form 2290 exceeds the tax due, how do I get my refund? If your total credit exceeds the tax liability, you can claim your credit to the maximum of your tax liability. Remaining credit amount must be claimed using a separate 8849 Form. To make it simple we generate a separate 8849 return, so that you can claim your credit easily. Is electronic filing required for each return reporting 25 or more vehicles? Electronic filing is required for each return reporting 25 vehicles or more vehicles that the tax payer files during the tax period. What is the purpose of the Form 2290? Use Form 2290 to: -	Figure and pay the tax due on highway motor vehicles used during the period with a taxable gross weight of 55,000 pounds or more. -	Figure and pay the tax due on a vehicle for which you completed the suspension statement on another Form 2290 if that vehicle later exceeded the mileage use limit during the period -	Figure and pay the tax due if, during the period, the taxable gross weight of a vehicle increases and the vehicle falls into a new category. -	Claim suspension from the tax when a vehicle is expected to be used 5,000 miles or less (7,500 miles or less for agricultural vehicles) during the period. -	Claim a credit for tax paid on vehicles that were destroyed, stolen, sold, or used 5,000 miles or less (7,500 miles or less for agricultural vehicles). What are the categories for which an amendment can be done? Can I start a new amendment return? Yes. You can start a new amendment return if you had not used taxexcise.com for your previous filed return or if you would like to start one from scratch. What are the categories of vehicles that can be amended? Vehicles which are taxable, creditable and suspended can be amended. Should I know the Taxable Gross Weight of the vehicle if I need to amend a vehicle for VIN correction? Yes. You should know the Taxable Gross Weight of the vehicle in order to amend for VIN correction. This is reflected in Schedule 1 of Form 2290. When can a vehicle be amended for a change in mileage use limit? A vehicle can be amended for a change in mileage use limit when the mileage limit of the suspended vehicle exceeds 5,000 miles (7,500 miles for agricultural vehicle) and the tax becomes due from that reported on the previous Form 2290. What is an amendment month? An amendment month is the month when the change in mileage use limit or the taxable gross weight occurred. Can the amended month and the month of first use be equal? The amended month ie the month when the mileage use limit of the suspended vehicle exceeded or the taxable gross weight of the vehicle increased can be equal to or greater than the month of first use. Is there any way that I could report decrease in taxable gross weight? The amendment in Form 2290 is applicable only for increase in taxable gross weight. In other words, only the additional tax can be reported on form 2290. What is meant by Full service? Full service denotes the service rendered by our support specialist to use our application taxexcise.com in a very friendly way. All you need to do is follow the simple steps listed below and enjoy the filing period. (i) Download the Excel Template. (ii) Fill the template with the following details: a. Tax Year and Month First Used b. Taxable Vehicle Information c. Prior Year Suspended Vehicle Information d. Credits on sold/ destroyed or stolen vehicle and Low Mileage vehicle e. Third Party Designee f. Filing and Payment Option g. Product or Service Payment Option (iii) Send the completed Excel Template to our support specialists through Email. Support@taxexcise.com (iv) We will complete your return with the details furnished in the excel template and mail you the generated Form 8879- Ex (IRS efile signature authorization form 720, 2290 and 8849) (v) You have to sign in the taxpayer’s section of Form 8879- Ex, as this will help complete the filing process. Once you have signed, choose any of the following ways to send the signed form 8879- Ex to us: Email : Support @taxexcise.com Fax : 1-866-256-9859 Mail to : ThinkTrade, Inc. 6395 Dobbin Road, Suite 204 Columbia, MD-21045 (vi) Your return is now complete and it is ready to be filed. What is meant by Referral Scheme? Once your return is either transmitted or printed, you can refer a friend inviting them to use taxexcise.com and can save for each referral. How can I refer a friend to your website? Once your return is either transmitted or printed, you can refer a friend inviting them to use taxexcise.com and can save for each referral. Enter the name and email address of a friend who has not used our product and we will send them an email explaining how they can avail the discount. You can save with every referral and there’s no limit to how many friends you can refer! What should be done with the referral code? Enter the referral code you received in the mail, during the registration process for an account with taxexcise.com and you will be provided with a discount. What is meant by Bundle Pricing? When your credits exceed the tax due, separate Form 8849 return is generated to enable claim your credits. Tax excise.com offers a special pricing offer called as bundle pricing which allows the user to pay once for Form 2290 and you can either transmit or print the 8849 return without paying for it separately. What is meant by Seasonal Pricing? Seasonal pricing offer is provided to enable the user pay once for the tax year and for a single business and file any number of returns. What are the Seasonal Pricing offers available? Can I pay my HVUT 2290 taxes using Credit or Debit? Yes, beginning from 2018 IRS has enabled paying 2290 taxes using credit or debit card, with a convenience fee is charged by these service providers who were approved by IRS. What if I found a mistake on Form 2290 that I just filed? A mistake can be fixed by preparing an amended return. What if the IRS asks me for Form 8453-EX? You will find Form 8453-EX in the PDF file that is created when you have finished entering all of the information needed to complete the return. Make sure that once you have printed out Form 8453-EX that you sign, date and enter the PIN you have selected on the form. You will need to keep Form 8453-EX so that when the IRS asks for it, you will have it completed. What if I have missed some vehicles on Form 2290 that I just filed? If you missed a vehicle/s you will need to create a new return and include the vehicle/s that have not been filed. What if the weight of the vehicle increases after I have filed Form 2290? If the vehicles weight increases after you have filed the return, you can amend the previously filed return and make the weight increase corrections. What if I have sold a vehicle which I reported as suspended? If a vehicle that was previously reported as suspended is sold, you will need to provide a statement to the buyer that includes the seller’s name, address, EIN; VIN; date of the sale; odometer reading at the beginning of the period; odometer reading at the time of sale; and the buyer’s name, address and EIN. If you do not provide the required statement to the new owner, you will be liable for the tax for that period. The buyer is then responsible for attaching this statement when they file Form 2290. You will have to wait until the next filing period to be able to claim a credit for the sale of the suspended vehicle if eligible. What if I buy additional vehicles? If you purchase additional vehicle/s, you will need to create a new return that includes the vehicle/s purchased and pay the taxes that are due. What if I buy a vehicle that was declared by the seller as suspended? The seller has to provide you with a statement that has the seller’s name, address, EIN; VIN; date of the sale; odometer reading at the beginning of the period and odometer reading at the time of sale. This information will let you know whether the vehicle will still be claimed as suspended when you file Form 2290. If the vehicle still qualifies as suspended you will attach the statement with all of the information as stated above. If you exceed the mileage use limit (5,000 miles or less 7,500 miles or less for agricultural vehicles) including the highway mileage recorded on the vehicle from the former owner for the period, and they have provided you with all of this information you will be liable to pay the tax on the vehicle/s. If the previous owner did not provide you with all of the required information as stated above the former owner is liable for the tax for that period. How do I get my Forms 720, 6627 and 6197? You can download Forms 720, 6627 and 6197 from “www.irs.gov”. Yes, you can have multiple businesses with single registration. Form 720 is used to file Excise Taxes like Environmental tax, Communication tax, Air transportation tax, Fuel tax, Retail tax, Ship passenger tax, Manufacturers tax, Foreign insurance tax and Floor stocks tax. Keep records of your tax return, records and accounts of all transactions for at least 4 years. Can I assign a third party designee to do my business? Yes, you can authorize a third party designee to exchange information concerning Form 720 with the IRS. What should I do if I do not have an EIN? Generally, a business needs an EIN (Employer Identification Number). If you do not have an EIN, you can apply for one online. E-Filing is transmitting Business Tax Returns to the IRS through the internet. Electronic filing is the safest, most secure and private way to send your tax return to the IRS. Once you E-file your return, you will receive an electronic acknowledgement that the IRS has accepted your return for processing. What are the due dates for filing Form 720? Form 720 must be filed for each quarter of the calendar year. If any date for filing a return falls on a Saturday, Sunday or a legal holiday, you may file the return on the next business day. How should I report no tax? If you are not reporting a tax that you normally report, enter a zero on the appropriate line of Form 720. Where do I send the Forms 720, 6627 and 6197 to file the Tax? You can send Forms 720, 6627 and 6197 to: Internal Revenue Service Center, Cincinnati, OH 45999-0009. To meet timely mail filing/paying, you can use DHL Express, Federal Express or United Parcel Service. The law provides penalties for filing a return late, depositing taxes late, paying taxes late; willfully failing to collect and pay tax or file a return; negligence; and fraud. These penalties are in addition to the interest charged on late payments. The penalty for filing a return late will not be imposed if you can show that the failure to file a timely return is due to reasonable cause. Those filing after the due date must attach an explanation to the return to show reasonable cause. Penalties are applicable in addition to the interest charged on late payments. An Employer Identification Number (EIN) is also known as a Federal Tax Identification Number, and is used to identify a business entity. Generally, businesses need an EIN. Employer Identification Number is a 9 digit number assigned by IRS to filers of Form 720. What should I do if I need to change the address? If your address changes, make the corrections on Form 720 and check the Address change box above Part I of Form 720. You can make a Final return if you go out of business, or will not owe excise taxes that are reportable in Form 720 in future quarters. What should I do to make adjustments to liabilities reported for previous quarters? See Form 720X, Amended Quarterly Federal Excise Tax Return, to make adjustments to liabilities reported for previous quarters. What is meant by Communications Taxes? Communication Tax is the tax on communications services. Can I request for credits or refunds for the tax collected or paid over for nontaxable services? Yes, the tax collector or taxpayer may request a credit or refund for nontaxable services. What is Air Transportation Tax? Air Transportation Tax is the tax on transportation of persons or property by air. The percentage tax is for amounts paid for taxable transportation of persons by air. What is domestic segment tax? The domestic segment tax is the amount paid for each domestic segment of taxable transportation of persons by air. How do you prepare a report for uncollected tax? What does Gas guzzler tax mean? Tax on gas guzzling automobiles is gas guzzler tax. Which form has to be used for filing gas guzzler tax? Use Form 6197, Gas Guzzler Tax, to figure the liability for this tax. Attach Form 6197 to Form 720. Can I file a one-time filing of gas guzzler tax? If you import a gas guzzling automobile, you may be eligible to make a one-time filing of Form 6197 and Form 720. What are all the conditions that have to be met to file as a one-time filer? You do not import gas guzzling automobile in the course of your trade or business. You are not required to file Form 720 reporting excise taxes for the calendar quarter, except for a one-time filing. What steps are to be followed to make a one-time filing? File Form 720 for the quarter in which you incur liability for the tax. Pay the tax with Form 720. No deposits are required. If you are an individual and do not have an employer identification number (EIN), enter your social security number (SSN) Individual Taxpayer Identification Number (ITIN) on Form 720 and Form 720-V in the space for the EIN. Check the one-time filing box on the line for the gas guzzler tax. What does vaccine tax mean? A tax imposed on the sale or use of a vaccine manufactured, produced, or entered into United States. What are the vaccines that are included under vaccine taxes? How is tax imposed on combination of vaccines? Tax is imposed on each vaccine included in the combination. Schedule A is to report Excise tax liabilities. Excise Tax Liability, is used to record your net tax liability for each semimonthly period in a quarter. What is the purpose of completing Schedule A? Complete Schedule A to record net tax liabilities for Part I taxes for each semimonthly period in a quarter even if your net liability is under $2,500. Should I have to record tax liabilities in Schedule A for any tax in Part I? You must complete Schedule A if you have a liability for any tax in Part I of Form 720. Can I use Schedule A to report Part II taxes? Do not complete Schedule A for Part II taxes. Can I use Schedule A for a one -time filing of the gas guzzler tax? Do not complete Schedule A for a one-time filing of the gas guzzler tax. Is additional reporting required in the month of September? An additional reporting is required under the special September rule. How to report the liability for the remaining days in September period? Is both the parties in an exchange liable for tax? No, the receiving person alone is liable for the tax. What does two-party exchange mean? A two-party exchange means a transaction (other than a sale) where the delivering person and receiving person are both taxable fuel registrants and all of the following occur. The transaction includes a transfer from the delivering person, who holds the inventory position for the taxable fuel in the terminal as reflected in the records of the terminal operator. The terminal operator in its records treats the receiving person as the person that removes the product across the terminal rack for purposes of reporting the transaction on Form 720-TO, Terminal Operator Report. The transaction is the subject of a written contract. Schedule C is used to make claims for credit or refund of excise taxes on fuels. What should I do if I took a deduction on the income tax return that included the amount of the taxes? You must include in gross income (income tax return) the amount from line 4 of Form 720. Claims can be made only if you are reporting liability in Part I or II of Form 720. What are the limitations in using Schedule C? If you are not reporting a liability on Form 720, in Part I or Part II. To claim amounts that you took or will take as a credit on Form 4136, Credit for Federal Tax Paid on Fuels, or as a refund on Form 8849, Claim for Refund of Excise Taxes, and its separate schedules (see the Caution later). To request an abatement or refund of interest under section 6404(e) (due to IRS errors or delays) or an abatement or refund of a penalty or addition to tax under section 6404(f) (due to erroneous IRS written advice). Instead, use Form 843, Claim for Refund and Request for Abatement. Also use Form 843 to request refund of the penalty under section 6715 for misuse of dyed fuel. To make adjustments to liability reported on Forms 720 filed for prior quarters, use Form 720X. What are the essential requirements to make a claim on fuels used for nontaxable purposes? Making a claim for fuel used during any quarter of a claimant’s income tax year, or aggregating amounts from any quarters of the claimant’s income tax year for which no other claim has been made. Claims must be filed during the first quarter following the last quarter of the claimant’s income tax year included in the claim. For example, a calendar year income taxpayer’s claim for the first quarter is due June 30 if filed on Form 8849. However, Form 720 must be filed by April 30. Only one claim may be filed for any quarter. The fuel must have been used for a nontaxable use during the period of claim. The ultimate purchaser is the only person eligible to make the claim. What proofs are to be included for making a claim for exported taxable fuel? The person who is eligible to make a claim is a claimant. Form 6627 is used to figure the Environmental taxes on petroleum, ODCs Ozone-Depleting Chemicals, imported products that used ODCs as materials in the manufacture or production of the product, and the floor stocks tax on ODCs. Can I add more lines in Form 6627? Yes, you can add more lines on any part of the form by preparing additional sheet in the same format. Is it possible to file the return for Form 6627 separately? No, you need to attach Form 6627 to Form 720.
Who must file the return for petroleum in Form 6627? The operator of the refinery that receives crude oil. The user or exporter of crude oil before tax is imposed. The person entering or importing the petroleum products for consumption, use, or warehousing. Who must file the return for ODC’s in Form 6627? The manufacturer or importer of ODCs who sells or uses those ODCs. The importer of taxable products who sells or uses those products. The person other than the manufacturer or importer of ODCs who holds ODCs for sale or use in manufacturing on January 1, 2007. What is meant by Exact Method? If you determine the weight of each ODC used as a material in the manufacture of the product and you can support this determination, this method of determining ODC weight is Exact Method. What is meant by Table method? If you use the ODC weight listed in the imported products table, this method of determining ODC weight is Table Method. What is meant by Entry value? Entry value is the value of the product when it first enters the US. On what type of automobiles, the gas guzzler tax is imposed? The gas guzzler tax is imposed on the sale, use, or lease by the manufacturer or importer of an automobile of a model type that does not meet certain standards for fuel economy. What does importer Election mean? Generally, an imported taxable product is taxed when it is sold or used by the importer. However, an importer may elect to treat the entry of products into the United States as the use of such products. This election applies to all products held by the importer when the election becomes effective. If an election applies to an imported taxable product, tax is imposed on the product on the date of entry. This election may be revoked only with the consent of the IRS. Am I eligible to make one-time filing without Employer Identification Number? Yes, you can make one time filing for which no Employer Identification Number is needed. You can use your Social Security Number or the Individual Tax payer identification Number to file the return. Environment Tax is the tax collected on oil spill liability, ozone depleting chemicals (ODCs) and floor stocks tax on ODCs. Are the automobiles imported for business or personal use subject to guzzler tax? Yes, the automobiles imported for business or personal use are subject to guzzler tax. What types of automobile are excluded from gas guzzler tax? Automobile does not include vehicles operated exclusively on a rail or rails; vehicles sold for use and used (a) as ambulances or combination ambulance-hearses, (b) as Federal, state, or local police or other law enforcement vehicles, and (c) for firefighting purposes; or non passenger automobiles as defined in 49 CFR (Code of Federal Regulations) 523.5. The ultimate purchaser of kerosene used in commercial aviation (other than foreign trade) is eligible to make this claim. The ultimate purchaser of kerosene used in noncommercial aviation (except for nonexempt, noncommercial aviation and exclusive use by a state, political subdivision of a state, or the District of Columbia) is eligible to make this claim. Do I need to pay the deposit for one-time filing? No, deposit is not required for one-time filing. What is meant by fuel economy? Fuel economy means the average number if miles an automobile travels on a gallon of gasoline (or an equivalent amount of other fuel) as determined by the Environmental Protection Agency (EPA). What does Model Type mean? Model type means a particular class of automobile as determined by the EPA regulations. Agri-biodiesel means biodiesel derived solely from virgin oils, including esters derived from virgin vegetable oils from corn, soybeans, sunflower seeds, cottonseeds, canola, crambe, rapeseeds, safflowers, flax-seeds, rice bran, and mustard seeds, and from animal fats. What is meant by approved terminal or refinery? What is meant by Biodiesel? Biodiesel means the monoalkyl esters of long chain fatty acids derived from plant or animal matter which meet the registration requirements for fuels and fuel additives established by the Environmental Protection Agency (EPA). What is meant by Blended taxable fuel? This means any taxable fuel produced outside the bulk transfer/terminal system by mixing taxable fuel on which excise tax has been imposed and any other liquid on which excise tax has not been imposed. This does not include a mixture removed or sold during the calendar quarter if all such mixtures removed or sold by the blender contain less than 400 gallons of a liquid on which the tax has not been imposed. The person who produces blended taxable fuel. What does bulk transfer mean? What is bulk transfer/terminal system? This is the taxable fuel distribution system consisting of refineries, pipelines, vessels and terminals. What is Diesel-water fuel emulsion? Diesel-water fuel emulsion means an emulsion at least 14 percent of which is water. Who is a position holder? This is the person that holds the inventory position in the taxable fuel in the terminal, as reflected in the records of the terminal operator. You hold the inventory position when you have a contractual agreement with the terminal operator for the use of the storage facilities and terminaling services for the taxable fuel. What is meant by a rack? This is a mechanism capable of delivering fuel into a means of transport other than a pipeline or vessel. The person, who owns, operates, or otherwise controls the refinery. Removal is any physical transfer of taxable fuel. It also means any use of taxable fuel other than as a material in the production of taxable or other fuels. What does taxable fuel mean? This means gasoline, diesel fuel, or kerosene. What does a terminal mean? This is a storage and distribution facility supplied by pipeline or vessel, and from which taxable fuel may be removed at a rack. Who is a terminal operator? Any person who owns, operates, or otherwise controls a terminal is a terminal operator. Who is a vessel operator? A person who operates a vessel within the bulk transfer/terminal system is a vessel operator. Which forms have to be used to report monthly information returns on receipts and disbursements of all liquid products? Form 720-TO and Form 720-CS are to be used to report monthly information returns on receipts and disbursements of all liquid products. Who must file Form 720-TO? Each terminal operator must file a separate form for each approved terminal. Who must File Form 720-CS? Form 720-CS is filed by bulk transport carriers (barges, vessels, and pipelines) who receive liquid product from an approved terminal or deliver liquid product to an approved terminal. Who are required to be registered for activities relating to fuels? You are required to be registered if you are a: Blender, Enterer, Pipeline operator, Position holder, Refiner, Terminal operator, Vessel operator, Train operator who uses dyed diesel fuel on his or her trains and incurs liability for tax at the train rate, or Producer or importer of alcohol, biodiesel, agri-biodiesel and renewable diesel. Who is a taxable fuel registrant? Registrant is an enterer, an industrial user, a refiner, a terminal operator, or a throughputter, who received a letter of registration under the excise tax registration provisions and whose registration has not been revoked or suspended. Gasoline means all products commonly or commercially known or sold as gasoline with an octane rating of 75 or more that are suitable for use as a motor fuel. This means all special grades of gasoline suitable for use in aviation reciprocating engines and covered by ASTM specification D910 or military specification MIL-G-5572. What are the taxable events on gasoline? The tax on gasoline is $.184 per gallon. The tax on aviation gasoline is $.194 per gallon. Tax is imposed on the removal, entry, or sale of gasoline. Is LUST tax applicable to gasoline blendstocks? Gasoline blendstocks may be subject to $.001 per gallon LUST tax. What items are included in gasoline blendstocks? Gasoline blendstocks include the following: Alkylate, Butane, Butene, Catalytically cracked gasoline, Coker gasoline, Ethyl tertiary butyl ether (ETBE), Hexane, Hydrocrackate, Isomerate, Methyl tertiary butyl ether (MTBE), Mixed xylene (not including any separated isomer of xylene), Natural gasoline, Pentane, Pentane mixture, Polymer gasoline, Raffinate, Reformate, Straight-run gasoline, Straight-run naphtha, Tertiary amyl methyl ether (TAME), Tertiary butyl alcohol (gasoline grade) (TBA), Thermally cracked gasoline, and Toluene. Any liquid that without further processing or blending, is suitable for use as a fuel in a diesel-powered highway vehicle or train, and Transmix. Transmix means a by-product of refined products created by the mixing of different specification products during pipeline transportation. Kerosene means any of the following liquids: •	One of the two grades of kerosene (No.1-K and No. 2-K) covered by ASTM specification D3699. •	Kerosene-type jet fuel covered by ASTM specification D1655 or military specification MIL-DTL-5624T (Grade JP-5) or MIL-DTL-83133E (Grade JP-8). What are the taxable events on Diesel fuel and Kerosene? The tax on diesel fuel and kerosene is $.244 per gallon. It is imposed on the removal, entry, or sale of diesel fuel and kerosene. What are the conditions to be fulfilled for imposing tax on Diesel fuel and Kerosene on removal from refinery? The removal of diesel fuel or kerosene from a refinery is taxable if the removal meets either of the following conditions: •	It is made by bulk transfer and the refiner, the owner of the fuel immediately before the removal, or the operator of the pipeline or vessel is not a registrant. •	It is made at the refinery rack. What are the exceptions for imposing tax on diesel fuel and kerosene? The diesel fuel or kerosene is removed from an approved refinery not served by pipeline (other than for receiving crude oil) or vessel. The diesel fuel or kerosene is received at a facility operated by a registrant and located within the bulk transfer/terminal system. The removal from the refinery is by: i.	Railcar and the same person operates the refinery and the facility at which the diesel fuel or kerosene is received, or ii. For diesel fuel only, a trailer or semi-trailer used exclusively to transport the diesel fuel from a refinery less than 20 miles from the refinery. What are the dyeing requirements for diesel fuel and kerosene? Diesel fuel or kerosene satisfies the dyeing requirements only if it satisfies the following requirements: •	It contains the dye Solvent Red 164 (and no other dye) at a concentration spectrally equivalent to at least 3.9 pounds of the solid dye standard Solvent Red 26 per thousand barrels of fuel or any dye of a type and in a concentration that has been approved by the Commissioner. •	Is indelibly dyed by mechanical injection. See section 6 of Notice 2005-80 for transition rules that apply until final regulations are issued by the IRS. Tax is imposed on the delivery of any of the following into the fuel supply tank of a diesel powered highway vehicle or train: •	Any dyed diesel fuel or dyed kerosene for other than a nontaxable use. •	Any undyed diesel fuel or undyed kerosene on which a credit or refund (for fuel used for a nontaxable purpose) has been allowed. •	Any liquid other than gasoline, diesel fuel, or kerosene. Generally, this back-up tax is imposed at a rate of $.244 per gallon. What does a later sale mean? The excise tax ($.244 per gallon) applies to kerosene sold for use by the buyer for a feedstock purpose if the buyer in that sale later sells the kerosene. The tax is imposed at the time of the later sale and that seller is liable for the tax. What are the taxable events on Kerosene used for aviation? Tax on Kerosene on use in aviation on a) removal directly from a terminal into the fuel tank of an aircraft for use in noncommercial aviation, b) on removal directly from a terminal into the fuel tank of an aircraft for use in commercial aviation (other than foreign trade) c) on removal directly from a terminal into the fuel tank of an aircraft for nontaxable uses or for use in foreign trade. What is meant by commercial aviation? Commercial aviation is any use of an aircraft in the business of transporting persons or property by air for pay. What uses are exempted from commercial aviation? Any use exclusively for the purpose of skydiving. Certain air transportation by seaplane. Any use of an aircraft owned or leased by a member of an affiliated group and un-available for hire by nonmembers. Any use of an aircraft that has a maximum certificated takeoff weight of 6,000 pounds or less, unless the aircraft is operated on an established line. What is meant by qualified methanol and ethanol fuels? Qualified methanol and ethanol fuels means any liquid at least 85 percent of which consists of alcohol produced from coal, including peat. Does reduced rate apply to qualified methanol and ethanol fuels? Yes, reduced rate applies to qualified methanol and ethanol fuels. What is meant by partially exempted methanol and ethanol fuels? Partially exempt methanol and ethanol fuels means any liquid at least 85 percent of which consists of alcohol produced from natural gas. Does reduced rate apply to partially exempted methanol and ethanol fuels? Yes, reduced rate applies to partially exempted methanol and ethanol fuels. What are the taxable events on alternative fuels? The taxable events can be delivery into the fuel supply tank of a motor vehicle, or motorboat, or on certain bulk sales. What does commercial waterway transportation mean? Commercial waterway transportation is the use of a vessel on inland or intracoastal waterways for either of the following purposes. •	The use is in the business of transporting property for compensation or hire. •	The use is in transporting property in the business of the owner, lessee, or operator of the vessel, whether or not a fee is charged. Should the record proofs of exportation be included for claiming exported taxable fuel? Yes, you should include the following records: A copy of the export bill of lading issued by the delivering carrier, A certificate by the agent or representative of the export carrier showing actual exportation of the fuel, A certificate of lading signed by a customs officer of the foreign country to which the fuel is exported, or A statement of the foreign consignee showing receipt of the fuel. What are the vehicles that are not subject to gas guzzler tax? Limousines with a gross unloaded vehicle weight of more than 6,000 pounds. Vehicles operated exclusively on a rail or rails Vehicles sold for use and used primarily: As ambulances or combination ambulance-hearses, For police or other law enforcement purposes by federal, state, or local governments, or For firefighting purposes. What are the taxable events on ODCs? Tax is imposed on an ODC when it is first used or sold by its manufacturer or importer. Is tax imposed on Recycled ODCs? There is no tax on any ODC diverted or recovered in the United States as part of a recycling process (and not as part of the original manufacturing or production process). There is no tax on recycled Halon-1301 or cess). There is no tax on recycled Halon-1301 or recycled Halon-2402 imported from a country that has signed the Montreal Protocol. Is tax imposed on ODCs used as feedstock? Does the transformation of an ODC into one or more new compounds qualifies as use as a feedstock? Yes, the transformation of an ODC into one or more new compounds qualifies as use as a feedstock. Is tax imposed on exported ODCs? Generally, there is no tax on ODCs sold for export if certain requirements are met. For a sale to be nontaxable, you and the purchaser must be registered. On which items of ODCs can a claim be made? Credit or refund (without interest) of tax paid on ODCs may be claimed if a taxed ODC is: Used as a propellant in a metered-dose inhaler, then the person who used the ODC as a propellant may file a claim. Exported, then the manufacturer may file a claim. Used as a feedstock, then the person who used the ODC may file a claim. What are the conditions allowance for ODCs exported? You must have repaid or agreed to repay the tax to the exporter, or obtained the exporter’s written consent to allowance of the credit or refund. You must also have the evidence required by the Environmental Protection Agency as proof that the ODCs were exported. on what basis is the tax imposed on ODCs? The tax on ODCs is based on the weight of the ODCs used in the manufacture of the product. What is the 'actual weight' of ODCs? The actual (exact) weight of each ODC used as a material in manufacturing the product. What is the rate of tax applicable, if I cannot determine the actual weight and the table does not list an ODC weight of a product? The rate of tax is 1% of the entry value of the product is applicable. What is Floor Stocks Tax? Tax is imposed on ODC held (other than by the manufacturer or importer of the ODC) on January 1 for sale or use in further manufacturing. The person holding title (as determined under local law) to the ODC is liable for the tax, whether or not delivery has been made. What are the ODCs not subject to floor stocks tax? Floor stocks tax is not imposed on any of the following ODCs: ODCs mixed with other ingredients that contribute to achieving the purpose for which the mixture will be used unless the mixture contains only ODCs and one or more stabilizers. ODCs contained in the manufactured article in which the ODCs will be used for their intended purpose without being released from the article. ODCs that have been reclaimed or recycled. ODCs sold in a qualifying sale for: a.Use as a feedstock, b.Export, or c.Use as a propellant in a metered-dose inhaler. What amount of net tax liability has to be deposited? Deposits of taxes for a semimonthly period must be at least 95% of the amount of net tax liability for that period, unless the safe harbor rule applies. What is meant by the Safe harbor Rule? The safe harbor rule applies separately to deposits under the regular method and the alternative method. Persons who filed Form 720 for the look-back quarter (the 2nd calendar quarter preceding the current quarter) are considered to meet the semimonthly deposit requirement if the deposit for each semimonthly period in the current quarter is at least 1/6 (16.67%) of the net tax liability reported for the look-back quarter. For the semimonthly period for which the additional deposit is required (September 1-11 and 16-26 for EFTPS, or September 1-10 and 16-25 for non-EFTPS), the additional deposit must be at least 11/90 (12.23%), 10/90 (11.12%) for non-EFTPS, of the net tax liability reported for the look-back quarter. Also, the total deposit for that semimonthly period must be at least 1/6 (16.67%) of the net tax liability reported for the look-back quarter. What are the exceptions to the Safe Harbor Rule? The 1st and 2nd quarters beginning on or after the effective date of an increase in the rate of tax unless the deposit of taxes for each semimonthly period in the calendar quarter is at least 1/6 (16.67%) of the tax liability you would have had for the look-back quarter if the increased rate of tax had been in effect for that look-back quarter; Any quarter if liability includes any tax not in effect throughout the look-back quarter; or For deposits under the alternative method, any quarter if liability includes any tax not in effect throughout the look-back quarter and the month preceding the look-back quarter. What are the requirements to apply the safe Harbor Rule? Make each deposit timely at an authorized financial institution, and Pay any underpayment for the current quarter by the due date of the return. If you meet the requirements and use the safe harbor rule. What is the payment procedure for excise taxes? Generally, semimonthly deposits of excise taxes are required. A semimonthly period is the first 15 days of a month (the first semimonthly period) or the 16th through the last day of a month (the second semimonthly period). What are the different situations where no deposit is required? The taxes are payable with the return. The net liability for taxes listed in Part I (Form 720) does exceed $2,500 for the quarter. The gas guzzler tax is being paid on a one-time filing. The liability is for taxes listed in Part II (Form 720), except the floor stocks tax that generally requires a single deposit. You can print for your recordkeeping before or after you e-file. Electronic Federal Tax Payment System – This is a free service provided by the U.S. Department of the Treasury, EFTPS allows all federal tax payments to be made electronically. Electronic payment method is convenient, safe and secure for paying taxes or user fees. Taxpayers can authorize an electronic fund withdrawal, use a credit card or enroll in the U.S. Treasury’s Electronic Federal Tax Payment System (EFTPS). There are two ways by which you can file your return: E- Filing is transmitting Business Tax Returns to the IRS through the Internet. Paper Filing is sending the Business Tax Returns to the IRS through the mail. What does filing form 720 electronically mean? File Form 720 electronically through any electronic return originator (ERO), transmitter, and/or intermediate service provider (ISP) participating in the IRS e-file program for excise taxes. Yes,you can come back and file your return. Yes,you can have multiple businesses with single registration. Yes, you can authorize a third party designee to exchange information with the IRS. What is Form 8849 for? Form 8849 is for the claim for refund of excise taxes. Can Form 8849 be used to make adjustments to liability or to claim any amounts that were or will be claimed on other forms? Do not use Form 8849 to make adjustments to liability reported on Forms 720 for prior quarters or to claim any amounts that were or will be claimed on Schedule C (Form 720)- Claims, Form 4136- Credit for Federal Tax Paid on Fuels, Form 2290- Heavy Highway Vehicle Use Tax Return, or Form 730- Monthly Tax return for Wagers. What is the purpose of the form 8849? Can a refund claim for the communications excise tax be made on Form 8849? A refund claim for the communications excise tax on nontaxable service billed after February 28, 2003, and before August 1, 2006, cannot be made on Form 8849. What is Taxpayer Identification Number (TIN)? Taxpayer Identification Number (TIN) can be either your employer Identification Number (EIN) or Social Security Number (SSN). Where to file schedule 1 and 6? For Schedules 1 and 6, mail Form 8849 to: Internal Revenue Service Cincinnati, OH 45999-0002. Where to file schedule 2, 3, 5 and 8? What are the information required to complete the schedules? What is an annual claim? If a claim was not made for any gallons during the income tax year on Form 8849, an annual claim may be made. Generally, an annual claim is made on Form 4136. What are the requirements for an annual claim? What is the Purpose of filling Form8849_Schedule1? Schedule 1 is used to claim a refund on the use nontaxable Fuels. What will be the Minimum claim amount to use Schedule 1? The Amount claim on schedule1 must be at least$750. Can we make multiple claim? No, only one claim may be filed per quarter. What if the minimum amount does not add up to $750 per quarter? You can aggreate amounts from any quarter in the same income tax year for which no other claim has been made. What is the requirement to make a claim on Form 8849_schedule1? A claim must be filed during the first quarter following last quarter included in the claim. For example a claim for the quarters consisting of july through September and October through December must field between January 1 and March 31. Where to file Form 8849 schedule1? For schedule 1 mail completed Forms 8849 Schedule 1 to: Internal Revenue Service Cincinnati, OH 45999-0002.
Who can use Form 8849-Schedule 2? A registered ultimate vendor of Undyed diesel fuel, Undyed kerosene, Kerosene sold for use in aviation, gasoline or aviation gasoline uses schedule2 to make a claim for refund. I don't have registration number. Shall I use Form 8849 sch2? if you don't have registration number you can't make this claim. What should I do if I don't have registration number ? Use Form 637, Application for registration to apply for one. Where to file schedule 2? Can I have some details on Registration number? Gasoline (including aviation gasoline) to a state or local government for its exclusive use or to a nonprofit educational organization for its exclusive use. UB: Ultimate vendor that sells undyed diesel or undyed kerosene for use in certain intercity and local buses. UP: Ultimate vendor that sells kerosene from a blocked pump. UA: Ultimate Vendor that Sells Kerosene for use in Aviation. What is the minimum claim amount for schedule 2? The amount of the claim must be at least $ 200. How often can I file Form 8849 Schedule 2? You can file this schedule more than once a quarter, as long as the period of claim is over a week and the claim amount is over $200. What is the requirement to make a claim on Form 8849-schedule2? The claim must be filed by the last day of the first quarter following the earliest quarter of the claimant’s income tax year included in the year. Can multiple credits be taken with respect to any gallon of fuel? Only one credit may be taken with respect to any gallon of alcohol, biodiesel or alternative fuel. How to file schedule 3 of form 8849? Attach Schedule 3 to Form 8849. On the envelope write “Fuel Mixture Claim” and mail to the IRS. What are the different credits that can be taken on schedule 3 of form 8849? What are Schedule 5 Section 4081(e) Claims? What are other exempt removals? If two taxes were paid on the fuel for which the claim is filed, then a claim for refund on the second tax can be made. The person who reported and paid the second tax on Form 720 on the same fuel is the “only” person eligible to make this claim. What are the claim requirements? The claim must be filed within 3 years from the time the return for the “second tax” was filed or 2 years from the time the second tax was paid. The government will take the latest of the two dates. What do you need to attach to the return? You must enclose a copy of the “First Taxpayer’s Report” that relates to the fuel covered for each claim And If the fuel was bought from someone other than the first taxpayer, a copy of the “Statement of Subsequent Seller” that the claimant received with respect to that fuel must be attached. How do I file Form 8849 Schedule 5? You can e-file both Form 8849 and Schedule 5 electronically to the IRS. This is the easiest and fastest way to get your refund. This also allows you to know if the information you submitted to the IRS is incorrect. If this happens we will guide you in making the corrections needed. You can also mail in your return if you would like. What is the purpose of the form 8849 – schedule 6? Schedule 6 is used to make claims on taxes reported on Form 720- Quarterly Federal Excise Tax Return, Form 730- Monthly Tax Return for Wagers, Form 2290- Heavy Highway vehicle Use tax return and Form 11-C- occupational Tax and registration return for Wagering. What is the requirement to make a claim on form 8849 – schedule6? A claim must be filed within 3 years of the filing of the return to which the claim relates, or 2 years from when the tax reported on that return was paid, whichever is later. What are the information that must be attached to complete the claim on schedules 6 for the tax reported on Form 720? Any additional information required by the regulations. The amount of the claim. If the claim is for more than one quarter, list the claim amounts by quarter. How you figured the claim amount. Any other information you believe will support the claim. What is the claim rate for the alternative fuel? The alternative fuel credit of $.50 per gallon or gasoline gallon equivalent (GGE) may be claimed on the alternative fuel. What is the claim rate for the undyed diesel fuel? The claim rate for undyed diesel fuel taxed at $.244 and used to produce a diesel-water fuel emulsion is $.046 per gallon of diesel fuel. What are the statements that must be attached for the claim on diesel-water fuel emulsion blending? The claimant sold or used the diesel-water fuel emulsion in its trade or business. What are the types of refund that can be claimed on schedule 6 for the tax paid on Form 2290? An overpayment of tax due to a mistake in tax liability previously reported on Form 2290. A refund of the tax paid on Form 2290 for a vehicle that was sold, destroyed, or stolen before June 1 of any period (July 1–June 30) and subsequently not used during the period. Any vehicle on which the tax was paid on Form 2290 if the vehicle was used 5,000 miles or less on public highways (7,500 or less for agricultural vehicles) during the period (July 1–June 30). What are the information that must be attached to schedule 6 to make a claim for a vehicle that was sold, destroyed or stolen? To make a claim for a vehicle that was sold, destroyed, or stolen, the following information must be attached to Schedule 6. Computation of the refund amount. Who can make a claim for a vehicle that was sold, destroyed or stolen? The claim is made by the person in whose name the vehicle is registered at the time it was sold, destroyed, or stolen. What are the types of refund that can be claimed on schedule 6 for the tax paid on Form 730? An overpayment of tax due to a mistake in tax liability previously reported on Form 730.
Credit for wagers laid off by you. What are the information that must be attached to claim a credit for laid off wagers? Whether any previous claim covering the amount involved, or any part, has been filed. What credit can be claimed on schedule 6 for the tax reported on Form 11-C? A claim for refund may be made for an overpayment of tax due to a mistake in tax liability previously reported on Form 11-C.
What is the Purpose of Form8849-Schedule8? Registered credit card issuers can make a claim for refund or payment of tax paid on certain sales of taxable fuel (Diesel fuel, Kerosene, and Gasoline) to state and local governments and certain sales of gasoline to nonprofit educational organizations. What is the minimum claim amount for schedule 8? What is the requirement to make a claim on Form 8849 schedule 8? On the envelope write “Registered credit card issuer claim” and mail the completed forms to the IRS at: Internal Revenue Service, P.O. Box 312, Covington, KY 41012-0312.